AEGIS is a 2.5 year project, co-funded by the European Commision that aims towards a data-driven innovation by taking into consideration heterogeneous, structured, unstructured, streaming and batch datasets, in order to rejuvenate the existing big data sharing and analysis models and facilitate companies and organisations to provide better and personalized services to their users. The AEGIS platform promises a novel approach in data sharing and exchanging: a safe environment for the stakeholders to sell and purchase datasets, data services, algorithms or intelligence reports. In order to reach its objective AEGIS needs to understand the ambient in which it operates and the needs of its stakeholders, so as to offer a set of services adding value to this value chain. Following an agile development approach, requirements were extracted and analysed, thus leading to the initial design of the AEGIS architecture. Functional and non-functional requirements were translated into technical requirements and mapped into functionalities of components, so that the set of components, comprising the holistic AEGIS architecture, covers the complete set of requirements. A graphical representation of the stable, version 1 of the AEGIS architecture is attached below. A detailed and in-depth description of the process followed for the definition of the AEGIS architecture can be found in our blog post here. 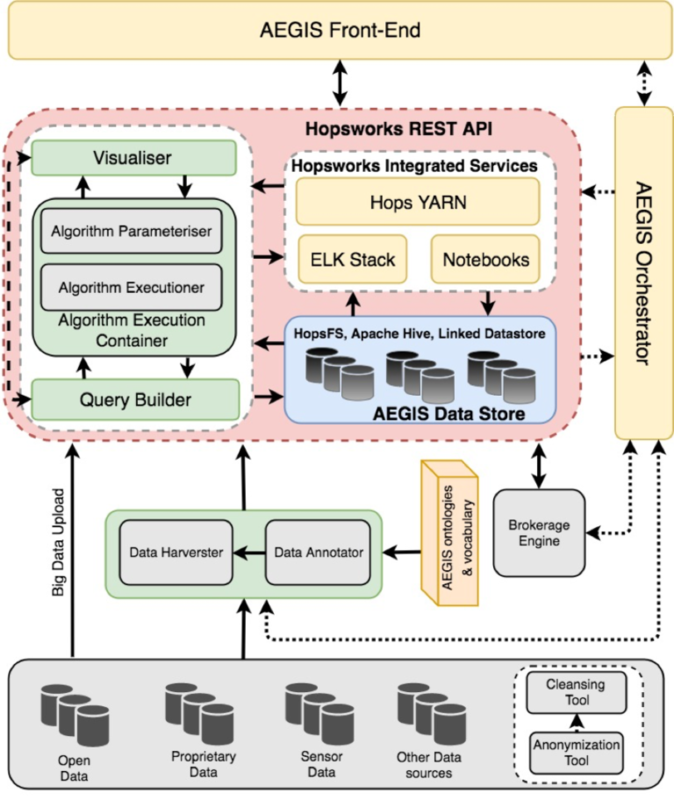 The associated deliverable D3.1 – Technical and User Requirements and Architecture v1.00, is available through our website at https://www.aegis-bigdata.eu/public-results. You can find out more on the AEGIS project by visiting https://www.aegis-bigdata.eu/.